“A Puzzlement” - sometime read the lyrics of this lesser-known song from Rodgers and Hammerstein’s “The King and I”. In it the King expresses his bewilderment at the changing world around him. But don’t we all feel like that? Buildings have gone, behaviour, attitude and dress have changed and seemingly, without any warning, we have found ourselves much older. Well, we believe our books can help to restore part of that lost world and, at the same time, introduce younger people to the fascination of it all. Another “puzzlement”, for a lot of you, is where our material originates. 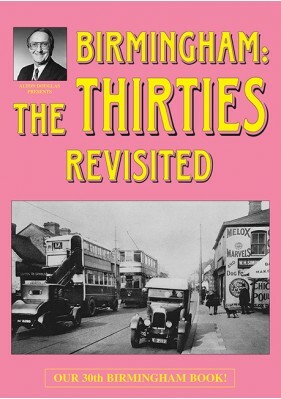 As an explanation, when we completed “Birmingham in the Thirties”, over a dozen years ago, we continued to search, mainly in private collections, for items from that decade as we do for every period. We were also given access to a large collection of postcards (one of the main forms of communication for many people in the thirties) and magazines as our network of contributors increased. Special mention must go to our friend Brian Matthews who has supplied us with, amongst other items, a cover picture for the last two titles. Sadly, over the years, several of our friends have passed on but we would like to think that we have done justice to their material. Anyway, the result, we hope you will agree, is a book of 400+ quite rare items - and life is less of “a puzzlement”.